Genesis Global Systems Inc. » Technology » Industrial Technologies » CTP "Coil to Panel"
The GenesisGSI Coil-to-Panel (CTP) Manufacturing Technology Platform is comprised of our proprietary Material Optimization Technology (MOT) and our C4 Fabrication Technology. This fully integrated solution provides the latest innovations in panelized light-steel framing which results in the most cost effective structural building system in the world. CTP Technology is a patented technology which enables the creation of a GenesisGSI light-gauge steel structural wall, floor and roof panels directly from multiple light gauge steel coils. Galvanized coils provide the raw materials that are formed into the various components, fabricated together resulting in custom structural light steel panels that are made to order in this just-in-time process. This synchronization and coordination of multiple machines integrated directly with our GenesisGSI Enterprise Manager Software (GEM) will provide many benefits to the overall manufacturing process with cost benefits being the single most compelling advantage of this technology. The MOT Solution leverages multiple forming machines into one integrated solution. The GenesisGSI Enterprise Manager (GEM) software communications through one central control, feeding unique panel component specifications to the applicable machine. MOT cold form light-steel coils into components of specific orofiles and dimensions for assembly into light-steel panels. The multiple units can be reconfigured to ensure optimal use of material or to match unique building designs. This innovative approach to material usage allows for a great market solution while still controlling costs. The quick set-up of multiple sizes and gauges allows for the optimization of materials by reducing weight and gauges in a multi-storey building. This weight reduction transfers into a reduction of overall building cost. In some building designs this can be as much as 30% savings in steel weight for each additional level of a building. Custom material knockout patterns are passed directly to each miachine and can be unique per panel and per piece. C4 Manufacturing Technology is the second element in the CTP Technology and comprises the custom structural component to panel assembly production. The C4 Assembly Line is uniquely flexible and will adapt to address each panels’ unique design requirements and specifications (e.g., width, length, thickness, number and types of connections). The C4 Assembly Line also includes a custom fabrication and semi-automated equipment that enables efficient and cost effective assembly of pre-cut light-steel-components into panels. The GenesisGSI Material Transport Cart and Rail System works in tandem with the MOT GMT Conveyor to queue and stage the pre-cut material for assembly. The carts glide above the track to make stops at “Pre-Welding” for quick assembly of welded posts and columns. 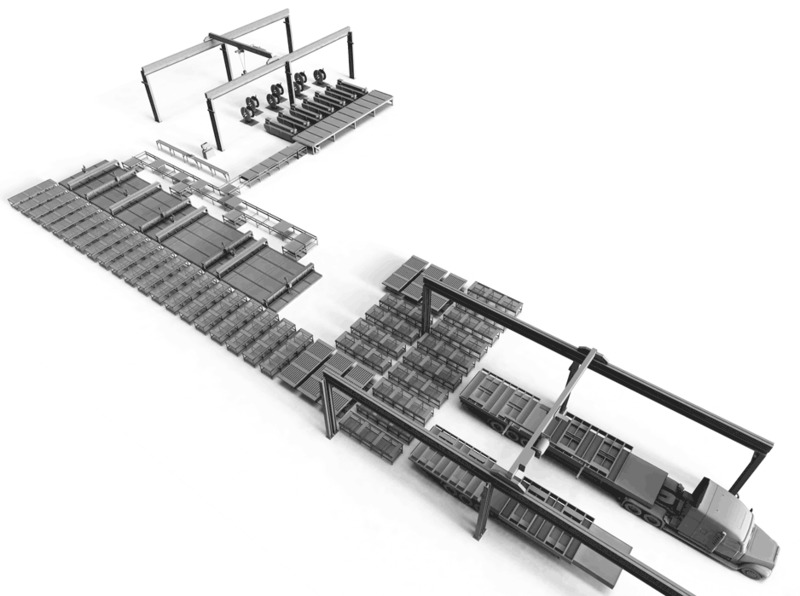 The controlled GMT Cart and Rail system automatically moves in sequence to the next available assembly station referred to as the GenesisGSI Framing Table (GFT). Depending on desired production output, 2, 3 or 4 tables are connected to the rail system. GFT table workers position and fasten all the connections on this compressing table to ensure the correct dimensions and layout are achieved. Semi-automatic screw dollies provide efficient and consistent screwing on connections. Using pop-up rollers, small and large panels are guided off the tables and towards the post-weld station. In order to manage workflow efficiently, 1 to 4 post-weld stations can be activated and the panels can be moved forward or sideways on a unique bi-directional roller system to ensure optimal usage of post-weld stations. Post-welders use boom operated welders to finish weld panels and are quickly able to reach all weld areas. For panels requiring sheathing, specific tables allow workers to fit, cut and fasten all types of sheathing before they are removed for staging by the overhead crane.